How well did you find your way around 1969 Chicago? Aside from the Douglas Park (Pink Line) &apos;L&apos;, this area has been completely transformed. One clue to the location is the trolley bus. 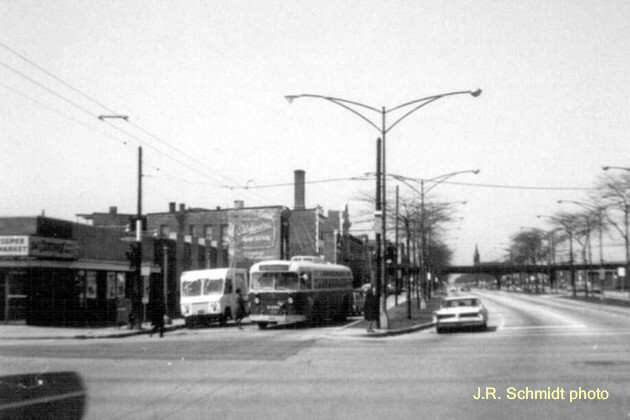 By 1969, only three trolley bus lines came within three miles of downtown. The arrangement of the traffic lanes is another clue. The center lanes on this section of Roosevelt were originally under the jurisdiction of the Chicago Park District, with no commercial vehicles allowed. Trucks and streetcars (and later trolley buses) used the outer lanes. BTW, the steeple in the background belongs to the long-gone St. Charles Borromeo Church, the setting for the 2003 book Muldoon, a True Chicago Ghost Story.